How to "make up" Adenium? You can paint or make up Adeniums as you wish. Where do we start? I have crossed many adeniums in the multiple sets also made every generation records in details with each set or each line for hybrid research. Then separate plants that look bad from the groups and keep newer or better hybrid that looks good for new breeding in next crossing generation. We created a range of five or F1-5, we can say that it is a pure strain then we will give new names to these new better hybrids. This is pretty steady or still high strain to produce new next hybrids. Of course, this process must take times at least a couple years to create each new hybrid or flower including stability test before release them to market but this breeding work must be very fun, happy and big proud when you see new flowers blooming with new colors and styles on your own desired trait. You have to work smart on this otherwise you would waste time for a year. Here below is what you should firstly concern before starting to make crossing. Not only you can give colors to flowers, you can also do with new trait and form. Blue is one of dreaming color, we wish we could have made all blue petals. 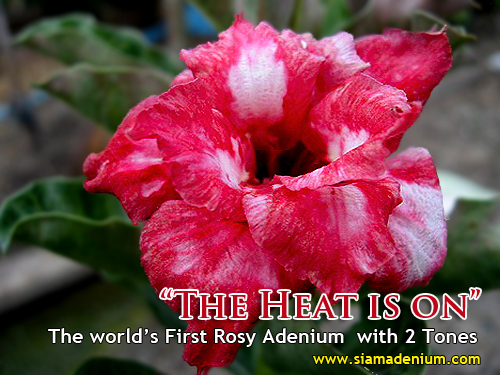 Now we can produce Rosy Adenium with flamable two color tones. characteristics in the primary structure such as fresh flower colors selection on your decision, big size, flower’s productivity, unique, etc. Step 2 Find a Father (pollen) that is unique or special characteristics of certain structural elements of the conflict (better) from the mother such as much more simple flower abundant blooming, multi-overlapping petals (Rosy Adenium), new leave styles. Step 3 Make father and mother healthier to help father can produce stronger and more pollen and mother can have also stronger ovary. This is also including better food delivery system effect to obtain a large pods and seed richness. Step 4 Do crossing very carefully to avoid self-pollination (To 'fix' certain traits in a plant, you can pollinate it with itself. 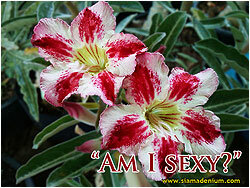 Self-pollination is the action of transferring pollen from a plant onto the stigma of a flower on the same plant.) . You can see the crossing method from this link. 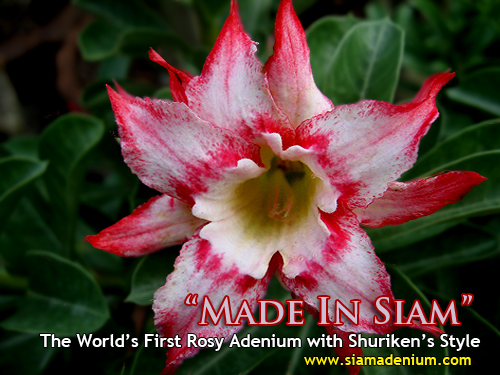 Our world's first Rosy Adenium with triple cream petals decorating with pink stripe. Single Adenium Petal is the key to produce nice Rosy Adeniums. We always use this Back Cross technique to get new Adenium flowers following with mother traits. encounter a failure and need to retrace your breeding steps. 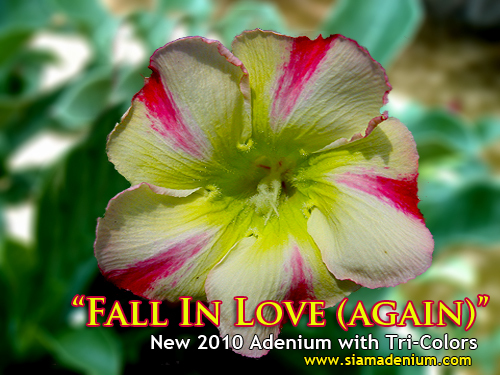 Healthy (not overfed) Adeniums are essential for good seed production. Be ruthless when selecting and discard all but the best. This will save a lot of time and effort in the long run. With either selection or cross-pollination you should make record on history work when a reasonable number of adeniums are fairly similar for the desired trait. Enclose a color photograph if possible. 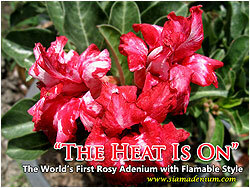 Knowledge of your adeniums will prove invaluable in your breeding work. Try to find out as much as possible about the genus or species you are working on before you start. 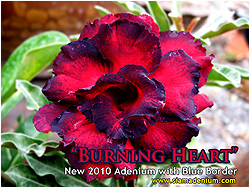 This is also a good way to check that there are no similar adeniums already in cultivation before you submit your entry. 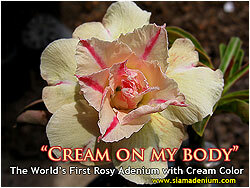 Make notes on breeding and at various stages of the adeniums growth and development. Let’s think about how fun on this work, if you have full different adeniums with many characteristics in your pocket. I think this’s all for today and please feel free to email if you have any comments or questions. Have a nice day.